Michigan Cherry Salad is a popular salad you’ll find on menus in restaurants all around Michigan. And it’s one of my favorites. 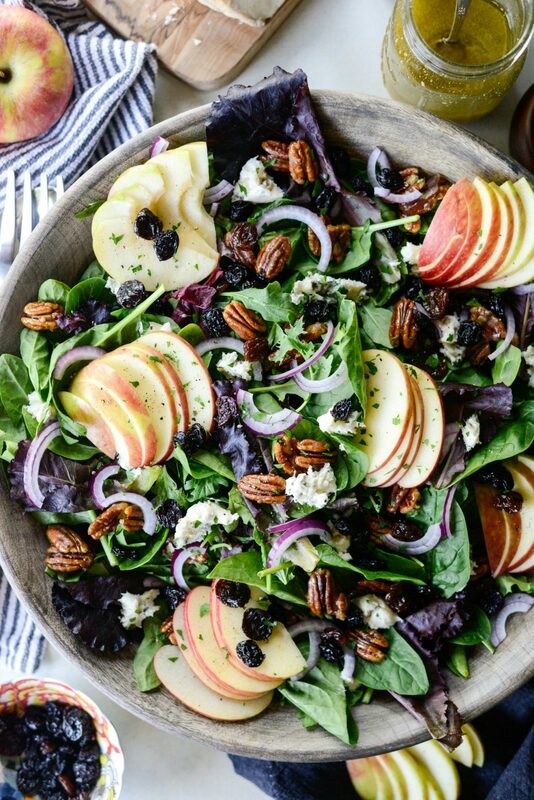 A mix of spring greens, baby spinach topped with sliced apples, red onion, dried cherries, pecans or walnuts and gorgonzola or blue cheese. Gah! This salad. 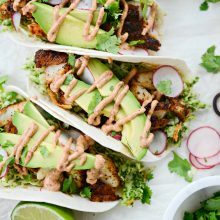 Filled with fall flavors and with lots of delicious goodies. If you’re ever in the mitten and see this on the menu, order it! 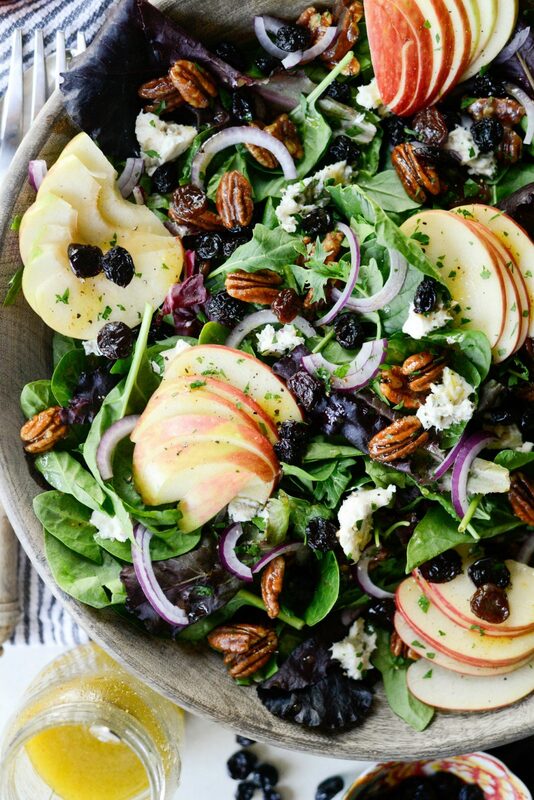 Spring greens topped with Michigan apples and dried cherries, thinly sliced red onion and blue cheese? What’s not to love about this salad? It even has candied pecans! Which is exactly why the is my favorite salad. It’s a collaboration of fruits, nuts, tender greens and red onions in a light vinaigrette. Sometimes it’s a raspberry vinaigrette and sometimes it’s not. 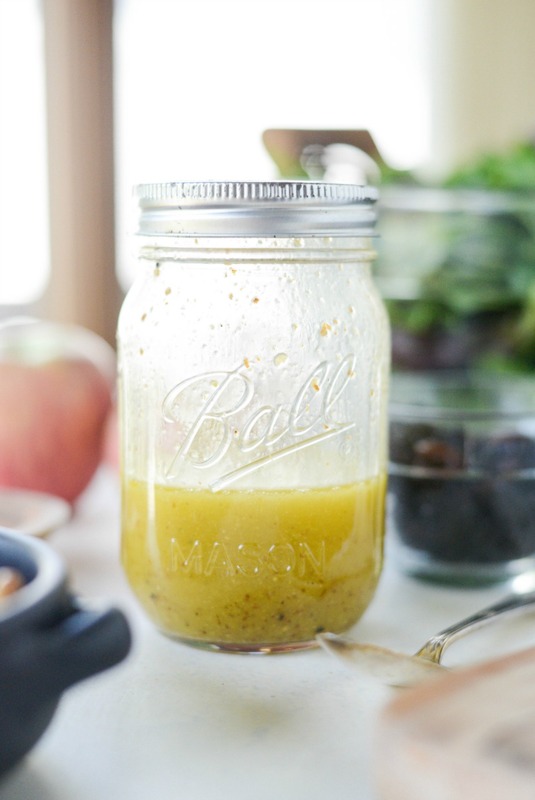 I like making a super simple cider Dijon dressing. 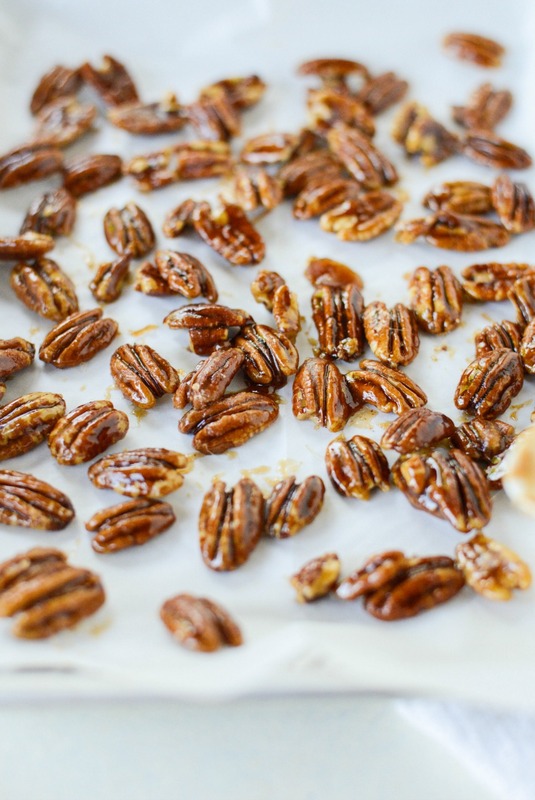 I also candied some pecans. Overachiever much? That is me. This salad is not just a pretty face, it’s delicious one. First candy the nuts. Lately, I’ve been all about candying nuts. First it was candied almonds, then these honey candied pistachios and now maple candied pecans but hey, walnuts work here too. 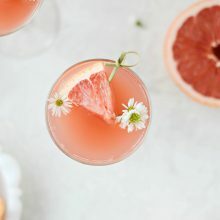 These are ridiculous easy and only take 3 simple ingredients. 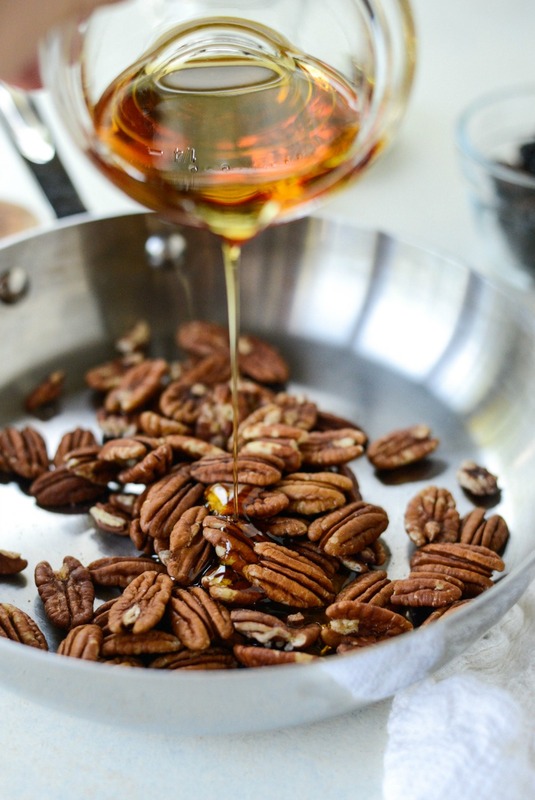 Start by adding a cup of pecans [or walnuts] to a 10-inch skillet. Then pour in 5 tablespoons of real maple syrup and a pinch of sea or kosher salt. Next heat on medium-high and stir often. 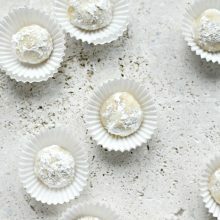 Once the maple syrup caramelizes and thickens and the nuts are toasted, then remove from the heat and carefully transfer the hot nuts to a parchment paper lined sheet pan. They’ll harden as they cool. 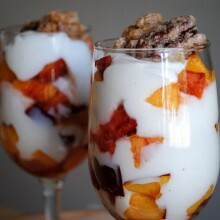 I have noticed that pecans tend to be a little softer than the walnuts afterwards. But maybe that’s just me. Now for the dressing! 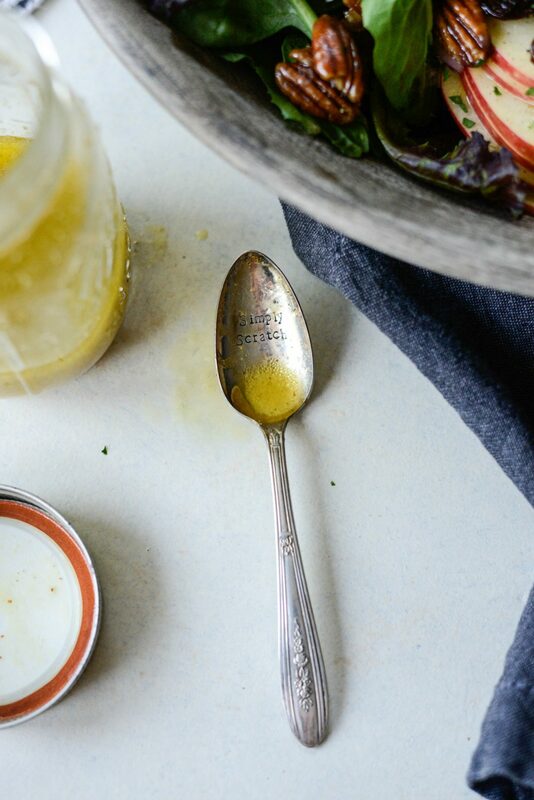 This is one simple vinaigrette. First, add a heaping teaspoon of Dijon mustard to a glass jar. 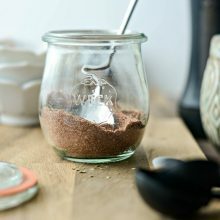 Pour in 1-1/2 tablespoons of maple syrup, 1/4 cup cider vinegar, a little [1/2 teaspoon] kosher salt and [1/4 teaspoon] freshly ground black pepper. Lastly, pour in 6 tablespoons of olive oil, shake and pour. Easy peasy and so good! 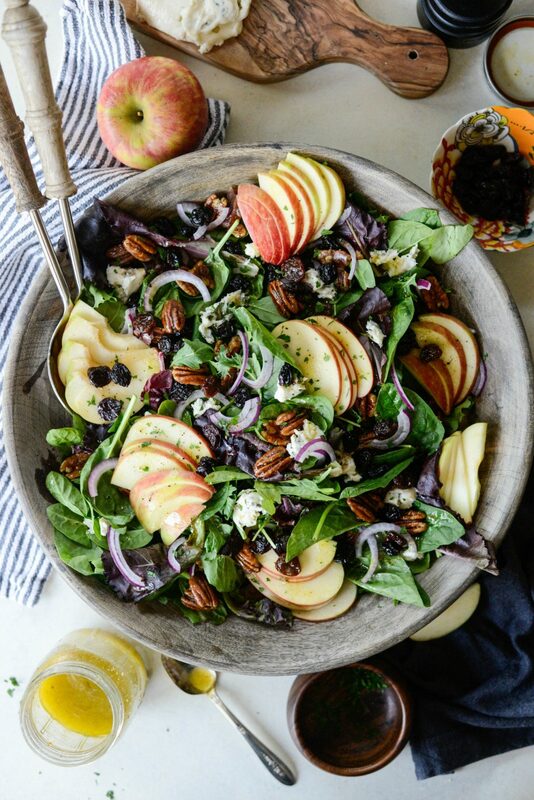 Next toss 5 ounces of spinach with 5 ounces of spring greens and top it with sliced honeycrisp apples, red onion, dried Michigan cherries, maple candied pecans (or walnuts), soft gorgonzola and fresh black pepper and some parsley too. 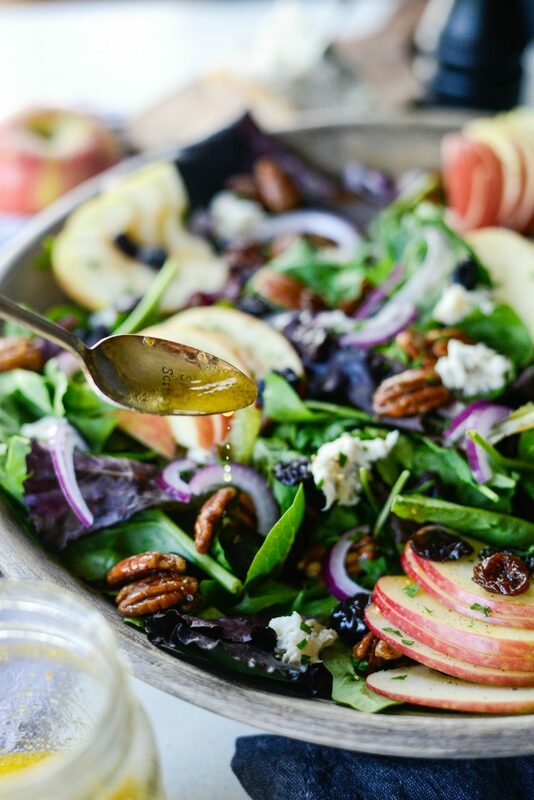 Then drizzle spoonfuls of the cider dijon dressing over the Michigan cherry salad. Prepare to fall in love. 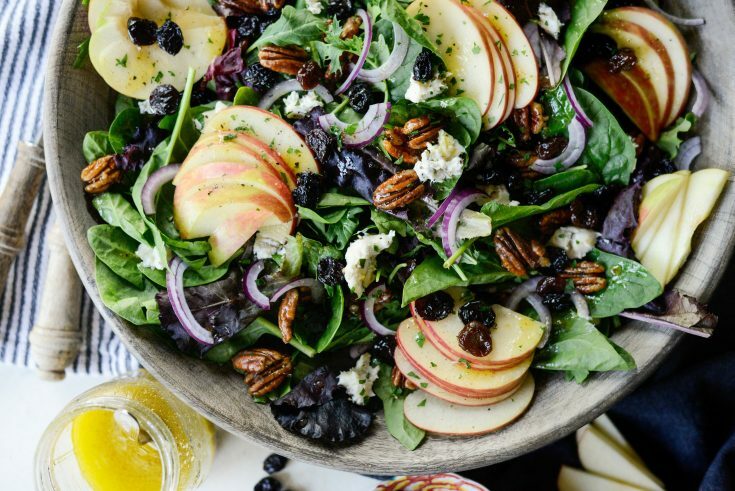 This is what fall salad perfection looks like. To make this an entree, pile the salad onto plates and top with sliced grilled chicken breasts. 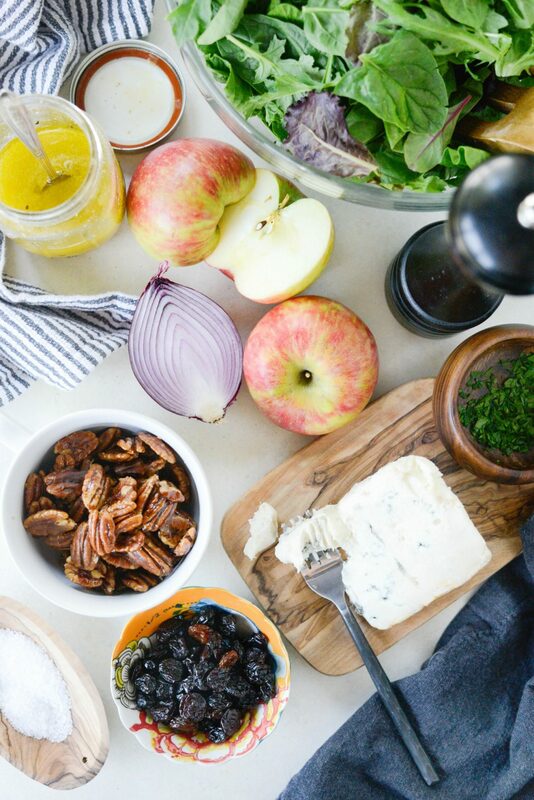 It’s a gorgeous salad and all of these ingredients work so harmoniously together. Crispy, salty and tangy, sweet and nutty… it’s fall’s best salad. Enjoy! 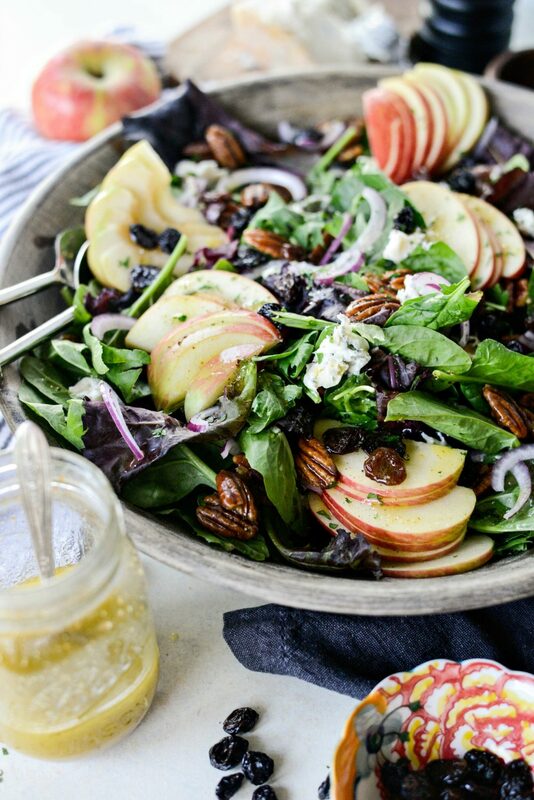 And if you give this Michigan Cherry Salad with Cider Dijon Dressing recipe a try, let me know! Snap a photo and tag me on twitter or instagram! Michigan Cherry Salad is a popular salad you'll find on menus in restaurants all around Michigan. And it's one of my favorites. 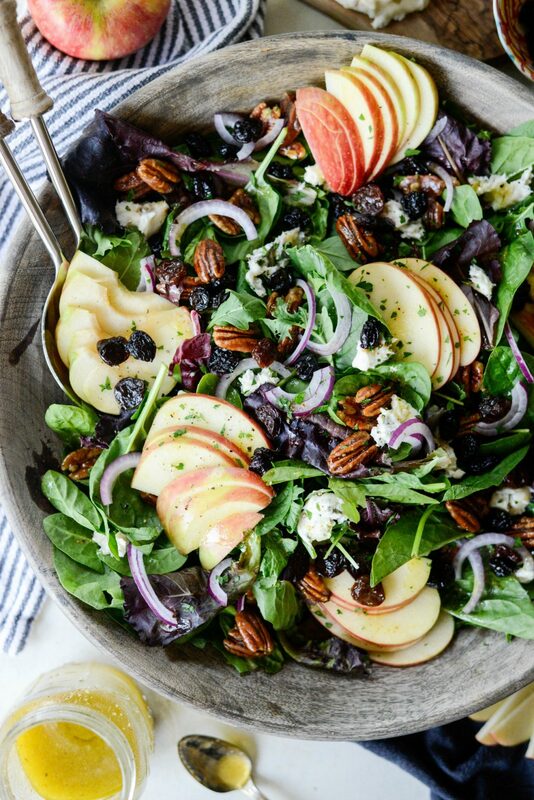 A mix of spring greens, baby spinach topped with sliced apples, red onion, dried cherries, pecans or walnuts and gorgonzola or blue cheese. Every bite you get a little something special. A little candied nut and cheese and apple is my favorite. 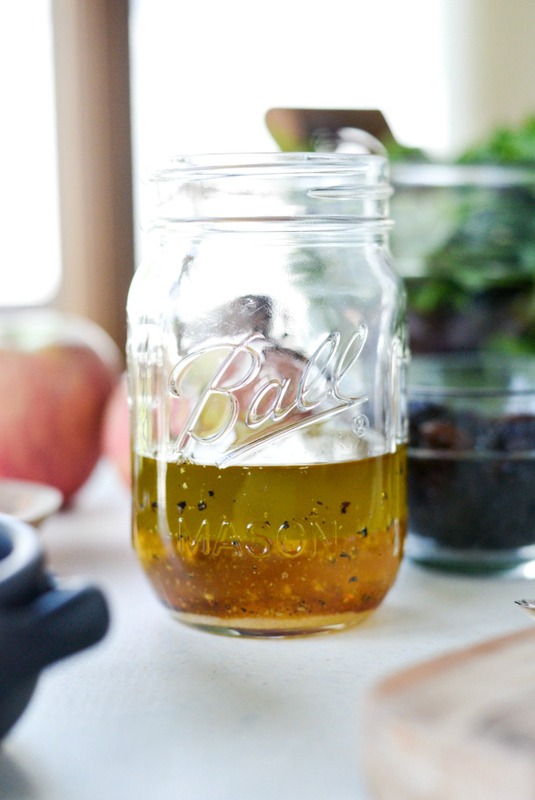 FOR THE DIJON VINAIGRETTE: In a glass jar, add Dijon, salt, pepper, maple syrup, cider vinegar and olive oil. Secure the lid, shake well before serving. 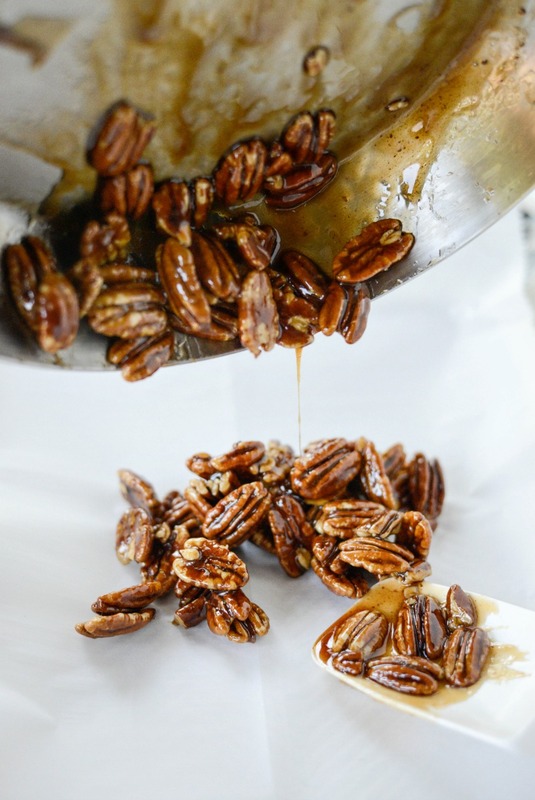 FOR THE CANDIED NUTS: Place the pecans, maple syrup and a pinch of kosher salt into a 10-inch skillet. 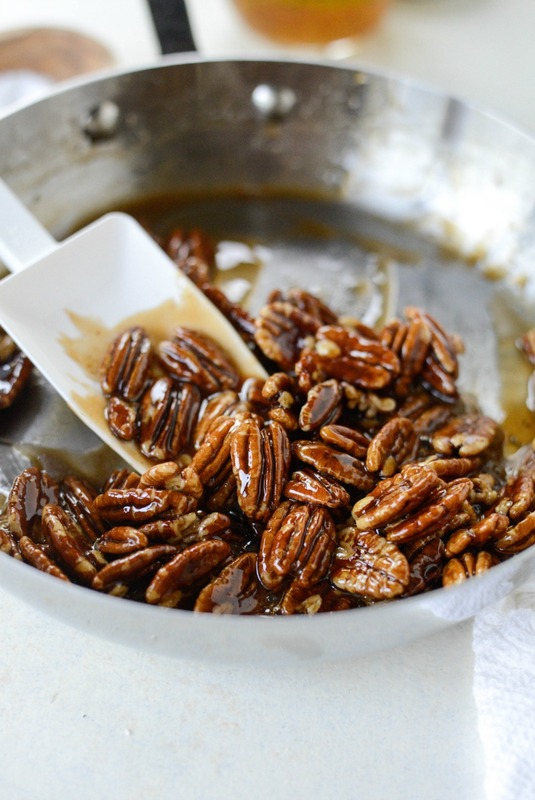 Heat on medium-high, stirring often until he syrup caramelizes and thickens and the nuts are toasted. Remove the pan off of the heat and carefully spread the hot candied nuts onto a parchment lined metal sheet pan. 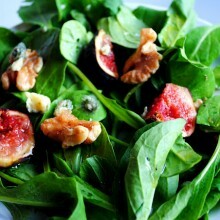 FOR THE SALAD: Toss the spring greens with the spinach. Top with sliced apple, red onion, crumbles of the gorgonzola, cherries and the candied nuts. Drizzle spoonfuls of the cider dijon dressing over top. Sprinkle with a little chopped fresh parsley and a few turns of black pepper. This salad looks amazing! 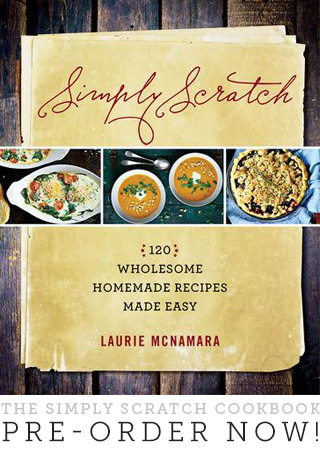 You always have the most creative salad recipes, Laurie! We love the one with roasted beets…So different! Can’t wait to try this one, its gorgeous!